Question: what is better than a baked sweet potato fresh from the oven? 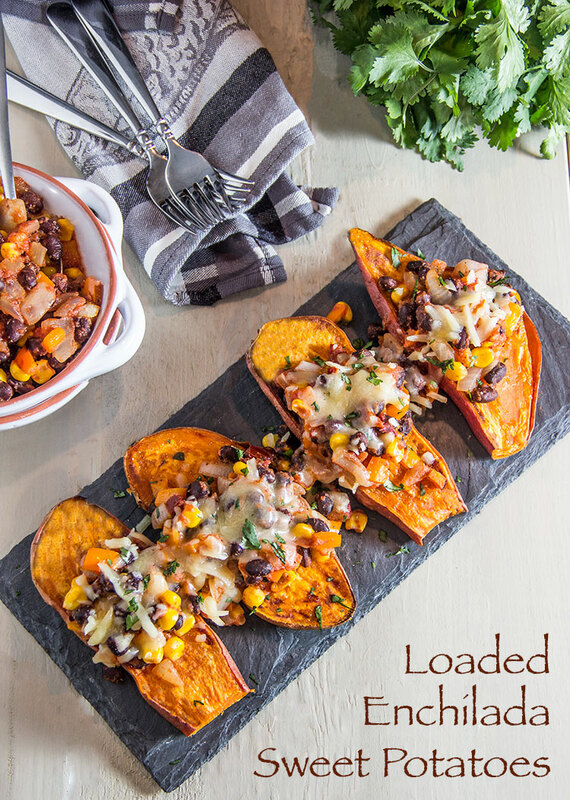 Answer: a loaded, spicy, cheesy enchilada baked sweet potato! This recipe is slightly spicy, flavor-filled, and really addictive. It’s also hearty and filling enough to convince Meat-and-Potatoes-Guy that a vegetarian dish can make a satisfying meal. 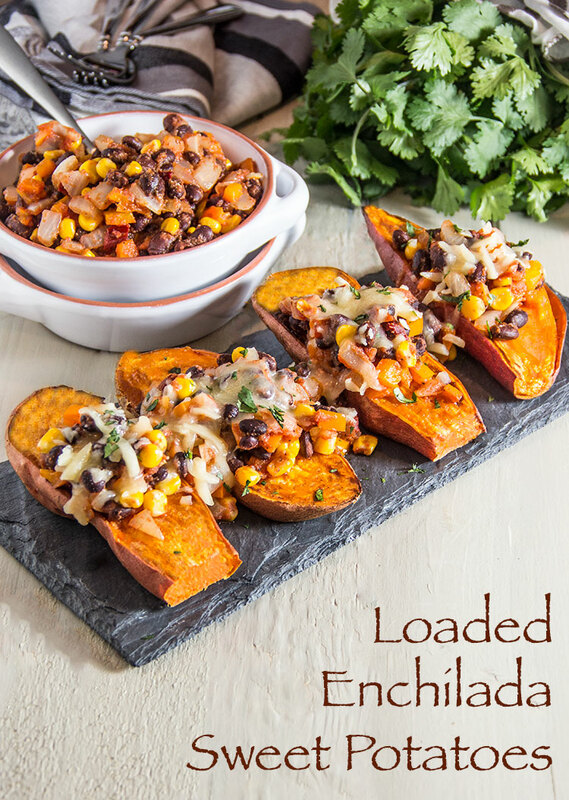 Loaded enchilada sweet potatoes are also packed with nutrition, with tons of filling protein and fiber (each serving contains 14 grams of fiber – that’s over 50% of the daily requirement!) 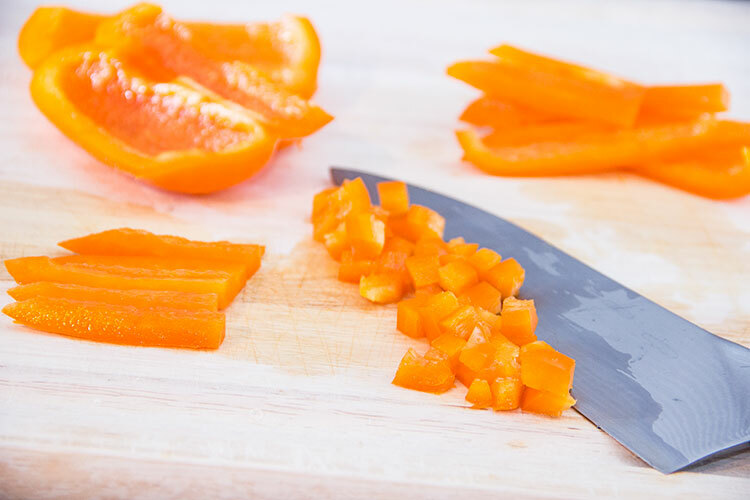 plus generous amounts of vitamin A and vitamin C.
Preparing one or more vegetarian dinners each week is one (extremely easy!) step you can take to help stop climate change and create a healthier planet. Our current levels of meat consumption produce more greenhouse gases (the gases, like carbon dioxide and methane, that cause climate change) than either transportation or industry! Who knew we could do so much to reverse climate change just by going vegetarian? Here’s everything you’ll need to get started. 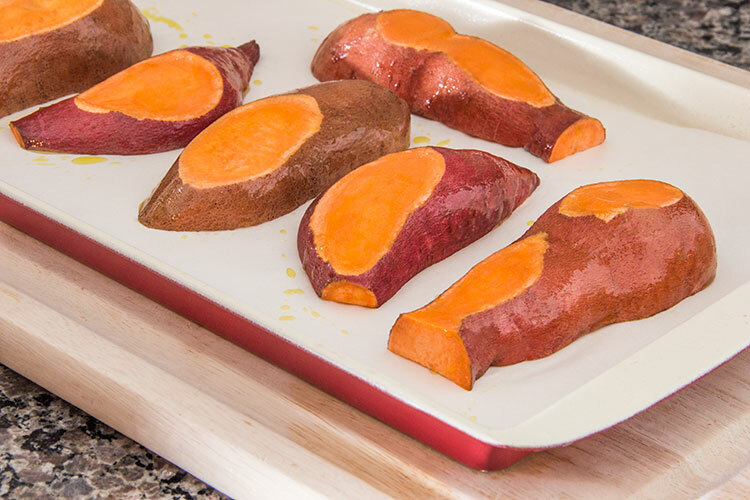 Begin by preheating the oven to 425 degrees F.
Grab some sweet potatoes (or yams) and cut them in half lengthwise. Then cut a flat notch along the length of the back (the skin side) of each half. Then place the potato halves on a parchment-lined baking sheet, skin-side-up, flat-side-down. Use a basting or pastry brush to brush the skins with a bit of olive oil. Bake the potatoes until they’re tender and easily pierced with a fork. Time Saver: When you’ve had a frantic day and you’re starving already, there’s a shortcut. Just leave the potatoes whole (don’t slice them in half) and jab them all over with a fork. Then microwave for about 6-7 minutes, or until they’re tender and easily pierced through to the center with a fork. The flavor and texture of microwaved potatoes doesn’t match oven-baked, but it’s an excellent substitute when you’re pressed for time. 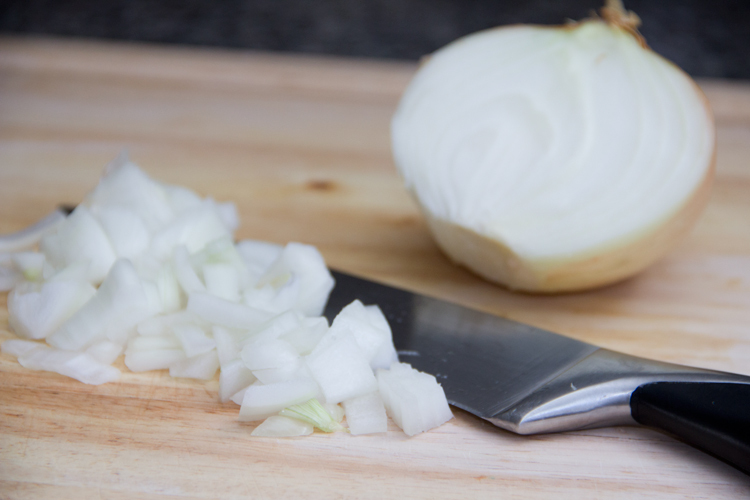 While the potatoes are cooking away, dice up an onion. And a bell pepper too. 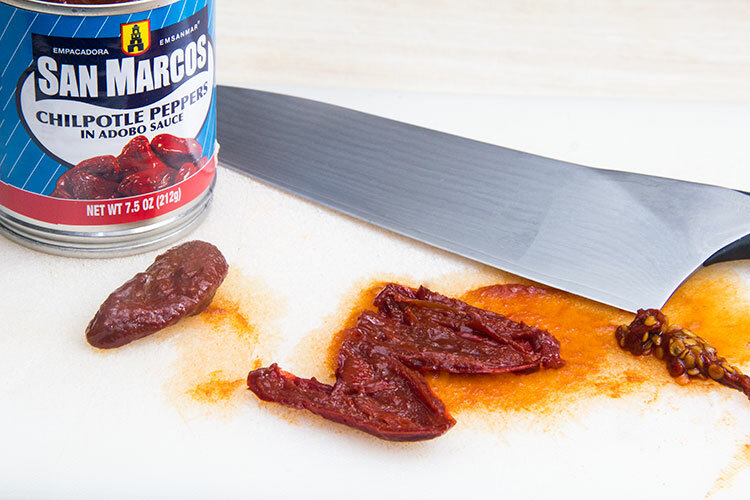 Grab a chipotle pepper in adobe sauce (find this in the international food aisle), cut it in half lengthwise, and scrape out all of the seeds (the seeds are extremely spicy). Then dice up the pepper. 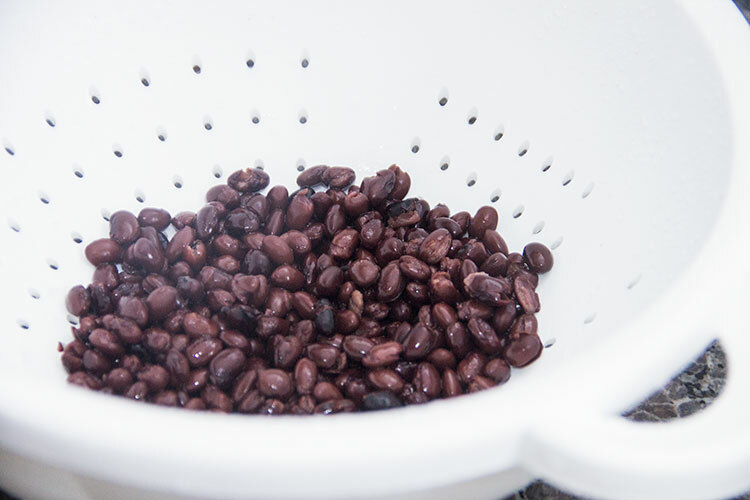 Next, drain and rinse off some black beans. Then heat some olive oil in a large sauté pan over medium heat. 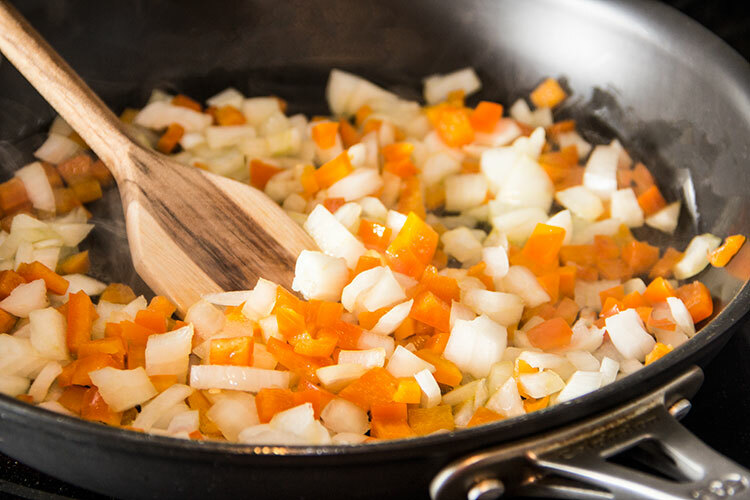 Add the onion and bell pepper and cook them until they begin to soften. Next, add the black beans and the chipotle. Also toss in some frozen organic sweet corn. Stir, and season everything with salt and pepper. Also add some garlic powder and cumin for plenty of rich flavor, and stir it all up. Pour in some strained tomatoes (or tomato purée) and let it simmer for a couple of minutes. Then smother each baked sweet potato with generous, heaping spoonfuls of the enchilada mixture! Top with plenty of organic shredded sharp cheddar cheese, which should melt right into the hot enchilada mixture. Or Make it Vegan: skip the cheese entirely. 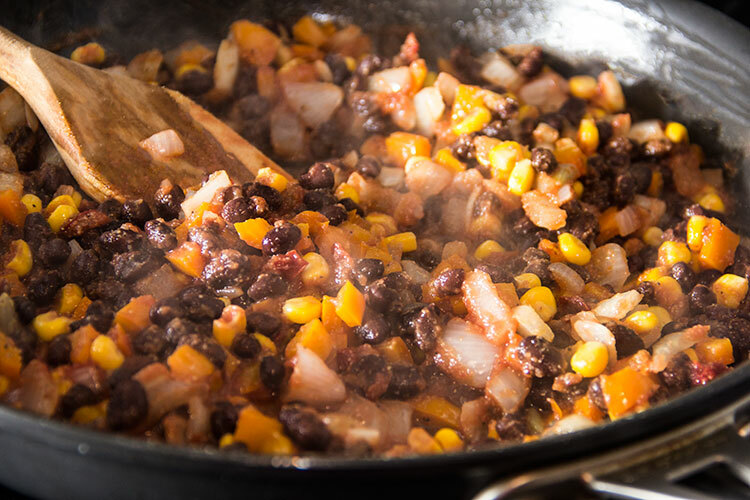 It’s not necessary in this dish – the enchilada mixture has plenty of flavor on its own! 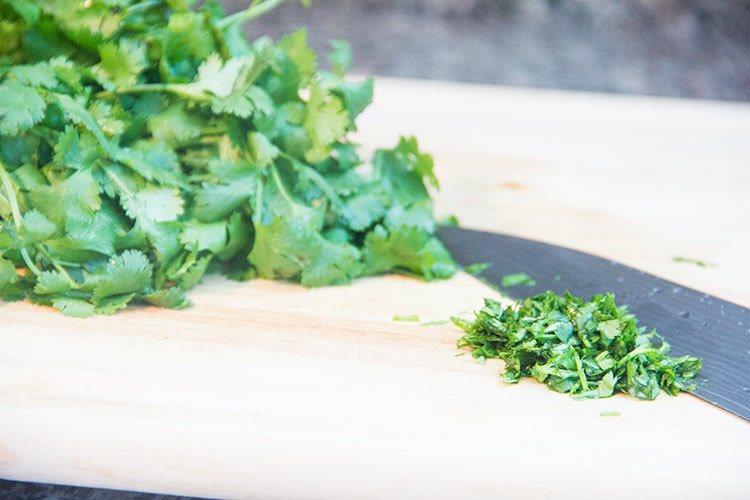 If you’d like, you can also chop a bit of cilantro to top off the potatoes. It adds another yummy layer of fresh, herby deliciousness! Final step: dig in and enjoy a slightly spicy, very rich and satisfying vegetarian/vegan meal. Really tasty and delicious (check). Super rich and filling (check). Easy enough to prepare in about 30 minutes (check). Vegetarian/Vegan meal that helps heal the planet (check). 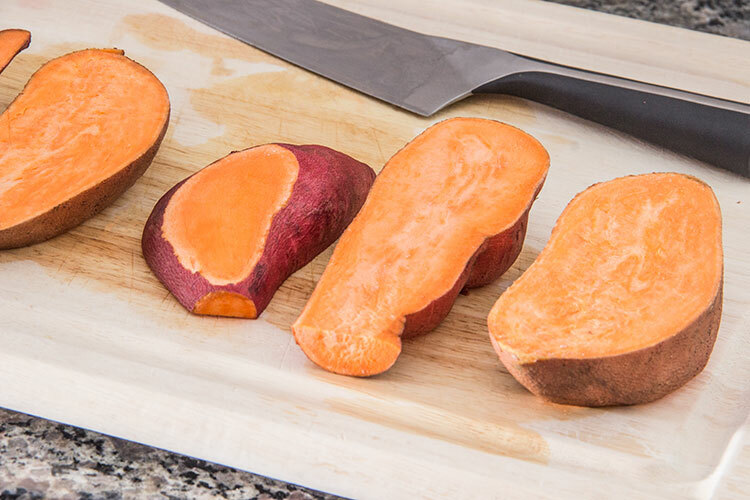 Who knew the sweet potato could be such an overachiever? Cut potatoes in half lengthwise. Also cut a flat lengthwise notch from the back (the skin side) of each potato half, which allows the potato to lie flat and upright when served. Arrange the potato halves on a parchment-lined baking sheet, skin-side-up, flat-side-down, so that no two are overlapping. Brush the skins with a bit of olive oil. Bake for about 16-20 minutes, or until potatoes are tender and easily pierced with a fork. Meanwhile, heat 3 tablespoons olive oil in a large sauté pan over medium heat. Add the onion and bell pepper and cook until softened, about 3-4 minutes. Add the black beans, chipotle, and sweet corn. Stir and season with salt and pepper. Add the garlic powder and cumin and stir until well combined. Add the strained tomatoes, stir and cook 2-3 minutes more. Season to taste with salt and pepper. 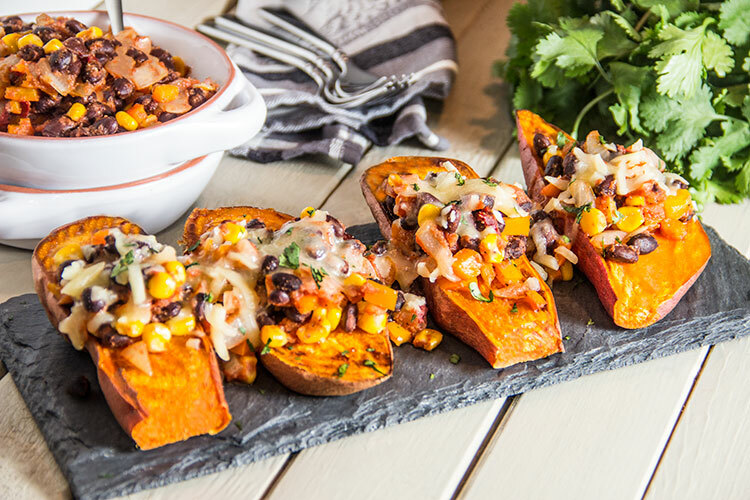 Top each baked sweet potato with heaping spoonfuls of the enchilada mixture. Sprinkle grated cheese all over the mixture (optional) and top with chopped cilantro (optional). 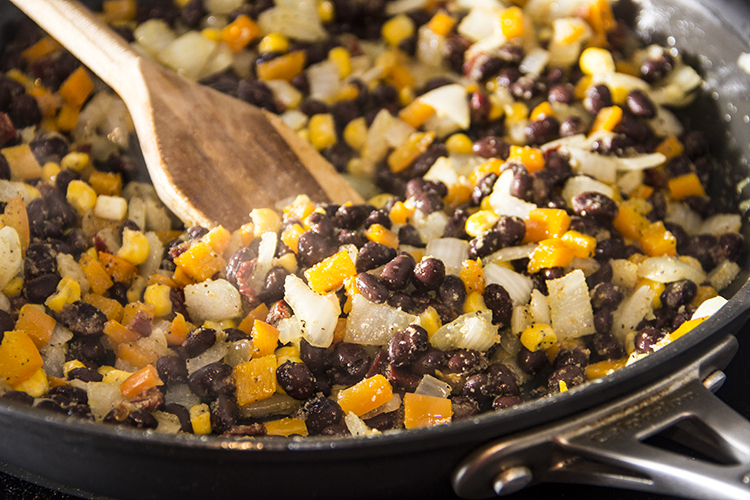 Black beans and sweet potatoes are one of my favorite combinations and this takes that combination to an all time high of deliciousness! Love this recipe!! Yum, these look and sound SO good! 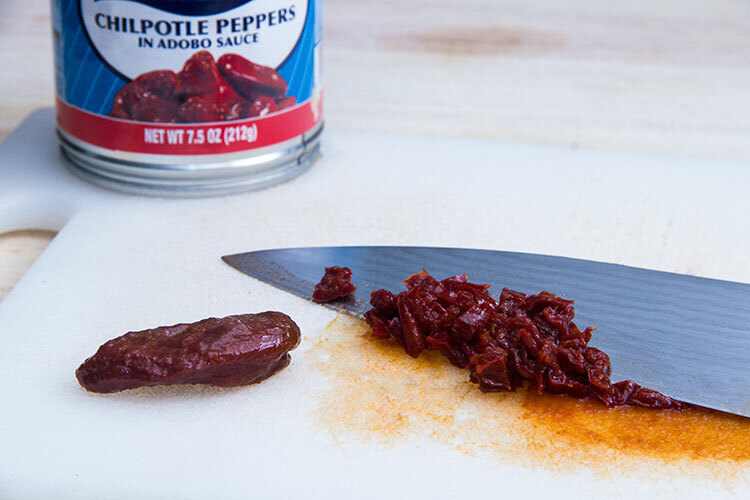 I love using chipotle peppers – such great flavor. 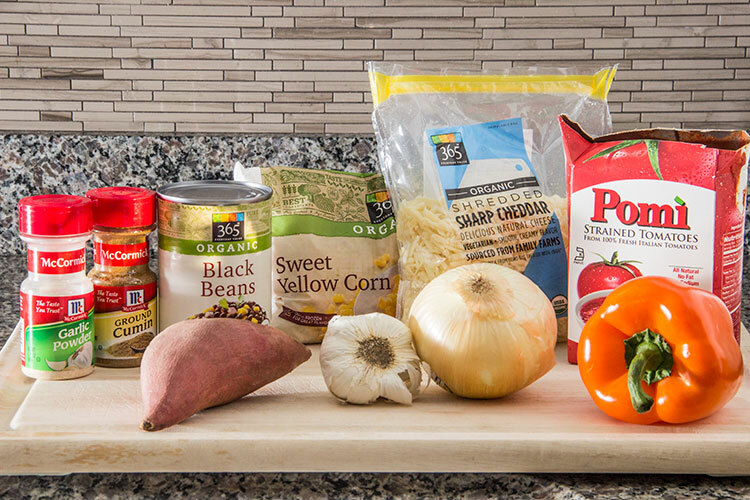 I’m definitely putting this recipe on my vegetarian dinner rotation! Sweet potatoes are my favorite! Definitely can’t wait to try this flavorful dish. This looks awesome an I’ll be making it tonight! I’m confused though because the picture shows yams (orange) not sweet potatoes (which are white). Thanks for the reply! I made it with “yams” and everybody loved it! So delicious and filling. Definitely adding it to my regular meal roster.